The other morning I heard one of my favourite songs, from one of my favourite films and I commented to a friend that I must have seen the film in question, about a gazillion times (it was Pretty Woman by the way). I'm not usually a fan of endless repeats, but sometimes, you just want the comfort of an 'old friend'. As I get older, I begin to appreciate more and more the importance and power of collaboration. And the joys of walking out my journey in the company of talented, clever and beautiful women. I originally wrote this piece back in 2012, but I've been mulling over its message for a while now and felt that it was okay to give this post a 're-run'. Especially, as one of those talented, beautiful sistas has written a book on sister power, which you can download for free. For those who have never read it, I hope it resonates with you. For those of you who may remember it from the first time round, I hope it's still fresh and gives you a new perspective on why, as women, we need to collaborate. Here are my top 3 ways in which I think as women we could support each other more. 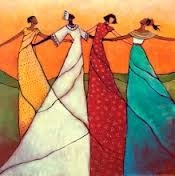 I’d love to hear from you all, about other ways that women can support each other, so please leave a comment on the blog. Firstly, I think women need to encourage each other. The word ‘encourage’ means “to give support, confidence or hope [to someone]. I don’t know about you, but I could do with a bit more of that in my life, particularly from other women. There’s just something about being supported by someone who understands what I’m going through, woman to woman. As women, we need to end the competition and rivalry that can so often creep into our relationships. There’s been a lie spread that there aren’t enough jobs, good men or opportunities to go round and so we have to connive and back-stab other women, in order to get ahead. I say it’s a lie, because if we sit down to think about it, we will soon recognise that we all have our own definitions of success and there is more than enough abundance to go around. My next point is that women need to empower each other. One of the meanings for this word is “to enable [someone] to do something. This is probably the one that resonates most with me, because this is what I do as a coach. My job isn’t to come as an expert, but rather to support my clients and enable them to come up with their own solutions. It is the solution that you come up with for yourself that you are most likely to stick with. The beautiful thing is that being able to empower isn’t limited to just coaches. As mothers we want to do this for our children, to help them develop the skills they need for life. As working women, coaching, mentoring and developing other women is important, to make sure that women excel in the workplace. As friends, we want to do what we can, to empower our girlfriends to be the best that they can be. Finally, in this sometimes tough and painful world, we need to comfort each other. To comfort someone means to “soothe in grief or console”. Life happens. We lose loved ones, we go through painful divorces, we lose jobs and sometimes we are challenged by disease and sickness. I know from personal experience, that when things have been tough it’s been the women who have stood with me, who have cried with me, who have prayed for me who have got me through. Everyone needs someone, especially in life’s most challenging moments. Someone who sees what we’re going through and comes alongside us to encourage us. As women, we are fortunate to be a little more emotional than men and so we find it easier to connect on a heart level with each other. When you’re going through a rough patch, you don’t necessarily want the rational or logical solutions first. Sometimes, you just want someone to give you a hug and tell you it’s going to be okay. As I end this week’s blog, I ask some questions of myself as well as you: who do I need to encourage? Who can I empower? Who needs my comfort? Or is it you who needs to be encouraged; empowered or comforted? If you would like to find out more about how coaching could help you in all of these areas, please call on +234 706 335 0864 or contact us through the website. A couple of years back, I had a challenging health situation. And as one does in these situations, almost the first thing out of my mouth was "why me?" I rehearsed over and over in my mind, the fact that I wasn't a bad person, that I did my best to be kind and generous to other people, so why was I facing this tough situation? One day I was having tea and cake at my favourite pity party and all of a sudden I thought "why not me?" Just exactly who did I think was "deserving" of the challenges I was dealing with? what kind of person deserved the pain and anguish that I was feeling? When we find ourselves in a difficult place, asking the question "why me?" is almost as natural and instinctive as breathing. This week I'd like to to look at both those questions from a different angle. A more positive angle, that could help us become a force for good. "...Who am I to be brilliant, gorgeous, talented, fabulous? Actually, who are you not to be? You are a child of God. Your playing small does not serve the world... we are all meant to shine, as children do. We were born to make manifest the glory of God that is within us. It's not just in some of us; it's in everyone..."
Although there are people out there who have both the profile and the platform to make change on a large scale, we shouldn't let the fact that we aren't famous or well known, stop us from bringing the change that we can. We can all make a difference- no matter how small, in our communities. Malala Yousafzai and Rosa Parks, didn't set out to make a grand statement. Malala wanted to be able to go to school and Rosa Parks was exhausted after a long day. But by standing up (or sitting down) for what they believed in, they made a difference. First in their communities and then on a huge scale. What is it that you have a passion for? What frustrates you and makes you long for change? What is it that gets you up in the morning and keeps you up at night? The state of the education sector? maternal mortality? Child poverty? Whatever it is, it's usually an indication of your purpose and a good place to start the process of being the change you want to see. Once you know where you want to focus your energy, then the next step is to take action. Dare to ask the question: why not me to make a difference here? (Excuse the poor grammar). A lot of us are passionate about issues, but when it comes to actually making a change, we start looking around for someone else to take action. We offer up all kinds of excuses: we're too busy; we're too shy; we're not educated or articulate enough. Or the big one, which is we're too insignificant. What or who gave you that idea? Never underestimate the power of one determined individual with a passion for change, to actually bring change! When I first got involved in violence against women work, I wanted to improve the experience for the woman right in front of me. As my passion grew, I got greedier and wanted to improve the experience for the woman in front of me and the one coming up behind her. Now, I'm at my most passionate and greediest and I want to improve the experience for women and girls in my community and larger. Women and girls that I haven't even met yet. My point? First find your passion, believe that you can make a difference and then head right out, to make a difference. I'd like to challenge you to think about your passion and your purpose this week. What are they? What are you doing with them? Are you making a difference in your community? How can you do more? Alone it may feel like we can't achieve much, but if we team up, with like minded individuals, we can be unstoppable. As an African proverb says "if you want to go fast, go alone, if you want to go far, go together". There's nothing as satisfying as knowing your purpose, recognising your power and being a force for change. Want some help identifying your purpose? Coaching can help you to clarify what you love to do. Call on +234 706 335 0864 or contact us through the website. What I love most is the fact that she doesn't worry about how her hug is going to be received, she doesn't worry about whether it's going to give me an advantage over her and she certainly doesn't worry about whether or not allowing herself to be vulnerable in this way is going to hurt. I'm reading a great book at the moment called "Daring Greatly- how the courage to be vulnerable transforms the way we live, love, parent and lead" by Brene Brown. As you might have guessed, it's about vulnerability. Specifically, how shame and vulnerability interplay and affect our lives. We can learn a lot from children about being vulnerable, because children don't generally have a problem with vulnerability. The problems start, when adults get into the mix and start introducing the issues that cause shame and fear in children. This week, I'm advocating that we all become a little more childlike when it comes to being vulnerable. Yes, being vulnerable is scary, but we are hardwired to connect to other people and that means being vulnerable. Something that has caused a lot of us to lose our capacity for vulnerability is the fear of or actually being hurt, when we reveal our hearts to other people. Criticism, judgement, bullying and abuse are just some of the ways that we can be shut down. If you are constantly being belittled or shamed, how likely is it that you will be comfortable with vulnerability. I'm always amazed at some people's reaction to a child who has hurt themself. They let them cry for a few seconds and then say " okay, stop it, that's enough". Who made them the arbiters of how long it's okay to cry for? I say if it hurts, cry! Obviously crying for hours over a minor tumble is a bit extreme, but in my experience, once a child is comforted, they tend to stop crying, within a short time. When we aren't allowed the space to express our vulnerability, it comes out in all sorts of other ways. For some people, they develop a hard protective shell, which they think will help, but in reality only keeps them locked in a place of hurt. Others don't know how to set boundaries and so they end up being taken advantage of, over and over again. For victims of any kind of abuse though, any display of vulnerability can be dangerous, because when we are dealing with issues of power and control, to be vulnerable, is to hand your abuser a weapon, that will be used to hurt you. For those of us who haven't/aren't experiencing abuse, vulnerability is scary, but allowing ourselves to be vulnerable is the only way, we truly connect in our relationships. Allowing ourselves to be vulnerable can leave us feeling seriously exposed. Exposed to the risk of being criticised, judged or hurt. But what's the alternative? That we protect ourselves so well from the risk of being hurt, that we don't actually have meaningful relationships with anyone around us? Can we really call that living? As human beings, we are made to form relationships, to connect with other human beings. You could say it's part of our wiring. I remember reading about some children in an orphanage who's physical needs were being taken care of, but they were never held or played with or interacted with. It had a seriously detrimental effect on their mental health. As adults, we might think we don't have to think about vulnerability any more, but I don't think that's true. When I moved back to Lagos, I was faced with the prospect of making some new friends or being destined to remain a "Millie no mates". I like to think that I'm quite comfortable talking to people. However, it's one thing to have a superficial conversation about the weather and quite another to have a proper conversation, that you hope will lead to making a new friend. I have to say, it was really quite nerve wracking! As parents, we need to consider being vulnerable with our children. When we pretend everything is always ok, when we act like we are always right, when we act like we have all the answers, we do our children a disservice. We rob them of the opportunity to see that vulnerability is not a weakness, but a strength. We rob them of the opportunity to fully connect with us, flaws and all and see that being perfect is not a requirement for being loved. This week, I'm challenging you to let down your guard a bit, relax and be a bit more vulnerable. Choose someone you feel safe with and reveal a bit more of yourself to them. You might be surprised at the results. I hope that you will "dare greatly" and take up my challenge. Let me know how you get on, by leaving a comment. Trying and falling/failing is never as bad as you think. Just before I took my first tumble, I kept thinking "oh my, what if I fall over now? How badly will it hurt?" And then I fell. You know what? The snow was surprisingly soft and it didn't actually hurt at all. That was a time I was glad of the extra 'padding' on my behind and the ski outfit :) In life, we can 'protect' ourselves to a certain extent from the consequences of falling/failing. What I mean is, we can identify the risks and take steps to deal with those risks, so that we are as prepared as we can be to step out. So, say you want to start a side gig. You could resign from your main gig and just go for it and I applaud those of you who would do that. For most of us, we'd do our homework, get any training we needed, raise funding if we need to and then work both gigs together. These are both valid approaches, as long as they both lead to action. I would have looked a bit weird, all kitted out in my skiing gear, but then refusing to actually take a step. That's what the fear of falling/failing does to a lot of us. We prepare ourselves and then refuse to take the last step, which is action. What have you prepared yourself for, but not stepped out to do yet? What's stopping you? If it's a fear of falling/failing, then I think I may have a solution for that. Make sure you are passionate about whatever it is you're afraid of failing at. Passion is like rocket fuel. It will keep you going, long after many a saner person would have given up. I didn't expect to like skiing, but from the first time I strapped on those skis, I was hooked. There was something so addictive about swishing down those slopes (baby ones of course) that made me keep getting up after each fall, determined to do better next time. And that my friends is my main point: failure only stops you, if you let it. Let's face it, not many of us are going to be perfect at something, the first time we try it. We usually have to learn, take a tumble, adjust and try again. When I started writing this blog, I have no doubt that I wasn't that great at it, but like skiing, I was hooked and so every day, I work hard to become better. What is it that you long to do? Are passionate about? but scared stiff that you're going to fail at? Can I suggest that you do all you can to prepare for it and then just get going. There is at least one failure behind every success story and when we share our fallings and our failings, we give other people just the push they need to stop dreaming and start doing too. Would you like some help getting started with your success story? then call us on +234 706 335 0864 or contact us through the website.